They’ve called him an ‘air head’ and routinely seen him as a ‘nosy neighbour’, but today Leo Varadkar is the UK’s best hope of getting a result in Brussels. With European leaders increasingly fed up with the antics of Westminster, there are some who would throw the UK to the market wolves. But Mr Varadkar has taken it upon himself to plead its case with little more than 48 hours until the latest doomsday. 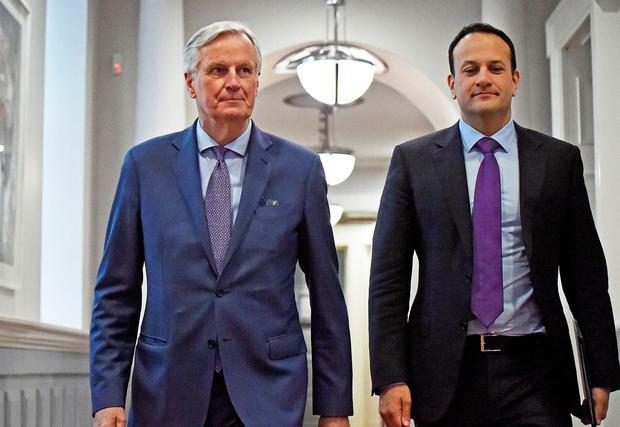 Naturally, the Taoiseach’s efforts to win an extension for the UK government are born out of self-interest rather than concern for embattled Prime Minister Theresa May. Ireland sees her letter asking for a delay until June 30 as a “positive step”. In fact, there is a consensus that the extension should go well beyond that date. The format of today’s emergency EU summit will see Mrs May deliver a presentation on her latest plan for salvaging Brexit. She will talk to EU leaders before leaving the room so that they can talk about her. And when Mrs May steps outside, the strongest voice to represent her views left behind will be Mr Varadkar. Even before the meeting starts, the Taoiseach has engaged in heavy lobbying during phone calls with leaders from the Netherlands, Malta and Luxembourg. Before arriving at the council he is scheduled to attend a European People’s Party gathering where other invitees include the leaders of Cyprus, Bulgaria, Romania, Latvia, Austria, Germany and Croatia. Mrs May will have a hard sell because in truth many leaders are fed up of her unfulfilled promises. She is walking a tightrope across the Channel as she tries to halt a complete split in her Conservative Party and convince Europe that more time is justified. During a phone call with Mr Varadkar earlier this week, she was “very firm” in stating that a longer extension must include a get-out clause. Holding European parliament elections in May will be difficult to stomach for all sides of the debate but at this stage it has to happen. Mr Varadkar said her desire to leave as soon as the Withdrawal Agreement, including the Irish backstop, passes through the House of Commons was “reasonable”. Ultimately the decision to be made by EU leaders will have to be unanimous so the extension date is likely to fall somewhere between the two months Mrs May is seeking and the one year Donald Tusk has suggested. Whatever conclusions are reached, Mr Varadkar said leaders should remember that the prime minister will have to sell it back in the UK. “We don’t want to cause a crash-out on Friday,” he said. So for the first time in a long time, Irish and British priorities will align at a European Council meeting – and perhaps good neighbours can become good friends again.